Two cheques were recently presented to the “Association des Parents d’Enfants Mentalement Handicapés” (APEMH) at the BGL BNP Paribas head office. In replacement for end-of-year gifts, the Corporate Banking and Asset & Liability Management (Treasury) departments decided to support APEMH with a shared donation. 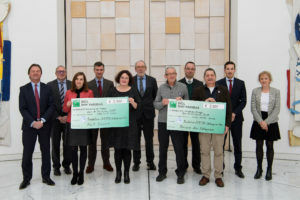 In the presence of representatives from both departments, two cheques for a total value of €10,000 were presented to the heads of the organisation. Founded by parents of children with mental disabilities, APEMH has worked tirelessly in support of young people with mental disabilities and their families since 1967. The charity’s primary goals are to defend the rights and interests of beneficiaries and to manage its range of resources and services. In the interests of meeting diverse needs and providing personalised support, APEMH offers a variety of solutions, resources, support systems and services. These may be on a one-off, recurring, regular or long-term basis, and include workplaces, training centers, day-care, accommodation and home visits. For APEMH professionals, the guiding principle is ensuring that beneficiaries enjoy the best possible quality of life. This initiative shows once again how BGL BNP Paribas is making good on its commitment to be a responsible bank and illustrates its active participation in social and civic life. APEMH (www.apemh.lu), founded in 1967, works to support people with mental disabilities. It offers a wide array of resources and services for people with mental disabilities and their families, regardless of age or life circumstances.